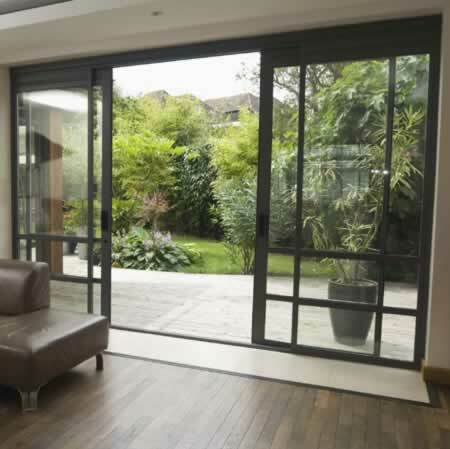 Glass pocket doors slide out of the way to bring the lovely tranquility of your yard into your favorite room. The external doors slide easily into the space created by the fixed interior door set without requiring additional room, inside or outside. Open or closed, the exterior pocket doors line up elegantly with the internal set to create an attractive nine-panel arrangement that provides frames the outdoor landscape to create additional interest. You can also select glass with e-coatings to cut down on rays that can potentially harm your valuable furnishings. A tiled entry separates the elements of the scene and protects the flooring beyond. When weather permits, the open pocket doors extend your living space outward across the deck, further opening your home for entertaining. The doors are a fantastic way to expand a smaller room and can create a serene bedroom when installed to open on the garden.